The store is closed for the next two days (Thursday and Friday) for a little break, but we have lots planned for the coming weeks. If you're out and about this weekend, please check in at your local retail stores. Portland wouldn't be the same without independent retailers and folks like you who support them! And if you haven't already heard, MD is open on Friday to kick of its Great Big Sale week. For some extra, local incentive, this Saturday, November 27th, Supportland is running a "Small Business Saturday" campaign and will be rewarding customers with triple the points at participating retailers (like Bolt!). They are also awarding 50 points for donations to the Portland Toy Drive at 10 local businesses-- check Facebook for box drop-off locations! 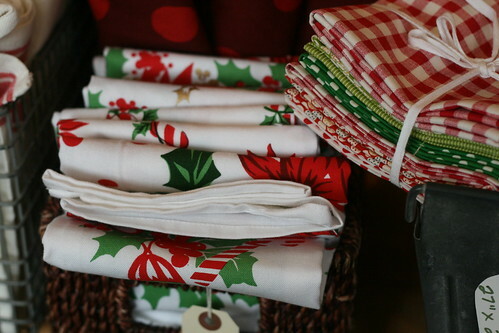 Crafty Wonderland is hosting the Cozy Community Project at their pop-up shop (802 SW 10th Ave). They'll be accepting donations of unused and handmade hats, scarves, gloves and blankets for the homeless from Friday through December 21st. If you don't have time to knit up a project on your own, they'll have some ongoing projects in the store for you to sit and knit a few rows on! Finally, Givehandmade is this Sunday, November 28th. There is going to be something for EVERYONE. This is being held in the beautiful Left Bank Annex near the Rose Garden. Plus, there will be goody bags for the first 100 people through the door. I'll be back this weekend with a Sewist Wishlist and some project inspiration!